Parking at the north end, restrooms and food near by. Wide walkways provide a safe edge. 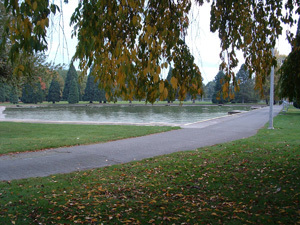 The Westmoreland Park casting pool offers Portland the perfect facility to display and promote electric and wind powered radio control model ships. The park setting and reflecting casting pool offers model builders, enthusiasts and their families a unique spot in the region. The pool’s smooth edges, casting platforms and wide surrounding walkways provide a safe setting for all. In the event retrieval of a stranded vessel is required, the smooth concrete bottom and even 30” depth provides model boaters with a safe pool to wade in. The pool lays in a vast open area allowing for good wind for model sailboats to criss cross the pool.